Do you have a blog or news site you like to keep up to date with? Do you find yourself having to visit it once a day or more, just to check for updates? With RSS, you can have updates delivered (to Google Reader) as they’re published. Additionally, you can add multiple subscriptions, so that updates from every site you usually visit will appear in the same place. Find the RSS feed on the blog. For Falvey’s blog, the link is located on the sidebar, under the header “Feeds.” Selecting “Content” will show you an RSS feed of the posts. Selecting “Comments” will show you an RSS feed of comments posted to the blog. 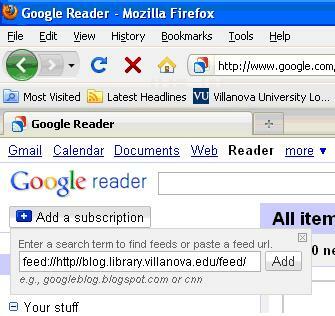 In Google Reader (http://www.google.com/reader/view/), click “Add a subscription” in the upper left corner. Then paste the link in the box which appears. This will automatically add the RSS feed to Google Reader. Once the feed has been added, you can read items in Google Reader. As you add each RSS feed, newly posted items will appear together in the same window. You can also use Google Reader to sort feeds into folders, or make notes on individual entries. Now you no longer need to visit each individual web site to check for updates. The updates come to you!